Edward Herbert, the 1st Baron Herbert of Cherbury KB, was a poet of English and Welsh origins. He was also a distinguished soldier, diplomat and religious philosopher. He was born on the 3rd March 1583 at Eyton-on-Severn in Worcestershire, the son of Richard Herbert whose family links to the Earls of Pembroke enabled him to occupy Montgomery Castle in Wales. He was taught privately at first before going to University College, Oxford where he matriculated in May 1596. He was married at the age of 15 to a cousin six years his senior. Accompanied by both his wife and mother he went back to Oxford to study languages, music and fencing, and he also learned to ride. Within three years he was in Parliament representing the people of Montgomeryshire as their “Knight of the Shire”. His rise continued with the award of a Knight of the Bath in 1603 and then further parliamentary and judicial appointments followed. He was much sought after at royal court and in London and Paris society and, among his many friends, were poets such as John Donne and Ben Jonson. His military career began in 1610, fighting in the Low Countries under the command of the Prince of Orange. 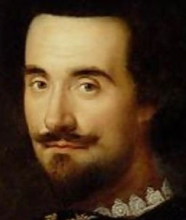 This led to more military action as he travelled across Europe, at one time assisting the Duke of Savoy and the Huguenots against Spanish forces. His exploits led to diplomatic posts at the French royal court, mostly successful but ultimately leading to his dismissal and return home, in debt, in 1624. His efforts had amounted to little in financial terms, although he was granted the Barony of Cherbury in May 1629. He was living in Montgomery Castle for some while, attempting to stay out of the political upheaval that would lead to the English Civil War, but he was unable to prevent Parliamentary forces taking his family seat in 1644. Thus, he was forced to return to London. Herbert’s literary accomplishments were centred on his claim to be “the father of English Deism”. It is believed that his major work De Veritate was the very first purely metaphysical treatise composed by an English poet. He produced a number of other religious works, in Latin, as well as some works of historical interest such as The Life and Raigne of King Henry VIII, published in 1649. As a poet he was compared favourably with his friend Donne with an ability to compose inspirational lyrical verses. Herbert was a deeply pious man, believing fervently in the power of prayer and God’s ability to give humankind the appropriate guidance for whatever problem or difficulty they might come across. There is a passage in his autobiography where he recalled the doubts he had about publishing his great work De Veritate. On his knees, praying for a sign, he believed that he heard God’s answer in a slight disturbance in the sky which, to him, was the confirmation that he needed before proceeding with publication. He also had no doubt of the existence of genuine miracles. Baron Herbert died on the 20th August 1648 at the age of 65. His body was buried in the London church of St Giles in the Fields.